The second Sunday in May is designated as "Mother's Day" here in the United States. It is a day to honor mothers and celebrate them. Looking forward to that day this weekend, we would like to share with you a recent post from the Manos del Uruguay blog, "Te Quiero Mama". The windows showcase designs and woven garments created by the artisans for the local markets and brands throughout the world. Manos del Uruguay is hosting a contest on their Facebook page (note, this is a separate page from the Manos del Uruguay Yarns Facebook page!) They have collected photo submissions of moms and the one with the most "Likes" will win a $2500 prize from the shops! Maybe your Mom would like something special created by your hands using Manos del Uruguay yarns? We try to share inspiring projects here on our blog and others also share their projects in our Ravelry group. 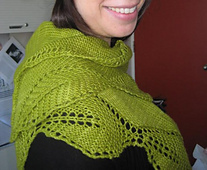 By searching the projects on Ravelry completed in Manos del Uruguay yarns and including "Mom" or "for Mom" as a search term you can have a peek at the items others have crafted with Mom in mind. The Flower Scarf designed by Robin Diliberto, knit by gaylynsdesigns using Manos del Uruguay Serena. The Garden View Shawlette designed by Tracey Withanee, knit by Miss Ourlet in Manos del Uruguay Silk Blend. 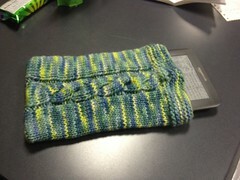 A kindle pocket, designed by Tahira Probst and knit by wewantmore using Manos del Uruguay Maxima. 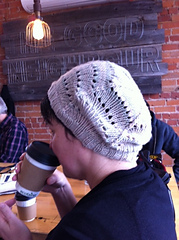 A Scallop Lace Hat designed by Leah Coccari-Swift and knit by crscntmoon in Manos del Uruguay Silk Blend. These are just a few, free, quick projects your mom might enjoy. Have you created something from the heart for your mother this year? We would love to hear about it and see pictures! Let us know with a comment here on the blog, in our Ravelry group, send us a tweet or post to our Facebook page! We wish all moms a "Happy Mother's Day!"